With six men able to play on the wing already, do Tottenham need the French star? There have been a few players at the recently concluded World Cup that wowed the Premier League, with never-ending pursuits of the likes of Sami Khedira, Mats Hummels and Angel Di Maria grabbing plenty of column inches. 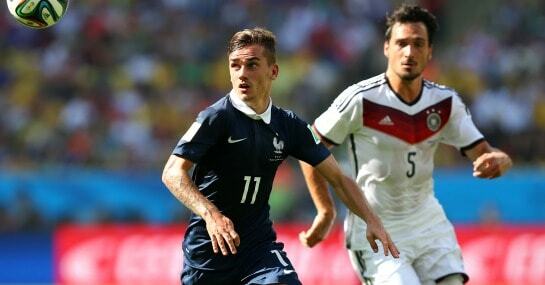 Perhaps no player at the Brazilian tournament has as many suitors as France’s Antoine Griezmann though, who was actively chased by the likes of Arsenal prior to the tournament, but now has Chelsea and Liverpool after him too. The queue of Premier League teams interested in buying the Real Sociedad man has another member at the back of it now, as Tottenham are rumoured to be willing to bid for the wide-forward. However, more than any other potential buyer, the Lilywhites have the least need for Griezmann and are in danger of flooding their squad with wingers ahead of the new season. Erik Lamela, Aaron Lennon, Nacer Chadli and Andros Townsend are already vying for the two touchline spots in the Spurs first team, with Christian Eriksen and Gylfi Sigurdsson also able to play on the left flank. Having clearly decided to stick with the two newest recruits to the White Hart Lane wing, in Lamela and Chadli, buying another player in that position seems like muddled thinking from the north London club, who are 7/2 to finish in the top four this term. Two full-backs to challenge the first-team places of Kyle Walker and Danny Rose are of far more importance to new boss Mauricio Pochettino, while a third striker to back up Emmanuel Adebayor and Roberto Soldado wouldn’t go amiss either. Having felt what it was like to have a transfer target snatched away from them last season, when Chelsea bought Willian from under their nose, a revenge mission could be on the cards with Spurs. But rather than worrying about hurting their rivals, it would be far more sensible for them to focus on themselves.